A few weeks ago I hinted about another painting project when I updated my bar/dining side table. Well, after many years of wanting to do this project, I woke up last weekend and just did it. It felt so good to update a dresser that I've had since I first started working as a teacher.. over ten years ago! Like the bar table, this was a big purchase for my early 20s self. It was still in good condition, but sorely needed a facelift. The inspiration for this project came from many sources, including these two. This painting project was a lot simpler than the Ikea bar/dining table because it did not have as many nooks and crannies. The exact Hemnes dresser that I have isn't the same as it was when originally purchased, but it basically is the same idea. It took less than ten steps and about two days with lots of downtime in between. Cleaning: There wasn’t a finish on this dresser. I simply used the frugal alcohol water mix spray we use to clean everything. When the drawers were removed, there was a beautiful layer of dust collected in the back that was cleaned off, ewww. Prepping: To make the painting process easier, I took out all the drawer sliders on the inside. Two screws each with the electric screw driver is all it took. Taping off some of the areas could have been done, especially on the drawers themselves, but the way the lines were on the dresser, it wasn’t necessary. I was able to paint without getting paint on the side drawer areas because they were not flush with the face of the drawers. The inside wasn’t completely painted, but one can only see that if you take out all the drawers and investigate. Primer coat: I used a foam brush and small foam roller for the two to three coats of tinted primer. Our local home improvement store paint department chose the primer especially for the job I was doing. They tinted the primer as dark as they could get it, which was a dark gray color. I know in the past I have been able to get my primer tinted black, but at this store they said they couldn’t do it. Top coat: Black glossy paint. It took about three coats with the foam roller and small foam brushes. Give yourself some time between the coat to let dry and really pay attention to any drip marks. They really show up when it is a glossy paint. I painted outside on a warm sunny day so it didn’t take much time to dry in between coats. Wait: After all the painting was done, I waited a few days before I put the dresser back together (sliders) and put on all the decorative ornaments. It felt a bit tacky after day one so I just let it sit until there was time to put it all back together. Decorate: You will need to play around with how and what you want to decorate the dresser, or even at all. There have been a ton of ideas where people are decorating the outside with grommets, etc. I had seen an idea with metal L-brackets, which I took and ran with it. The L-brackets are very inexpensive (pack of 4 was under $2 at Walmart) and easy to attach to the outside. I also attached new handle hardware. 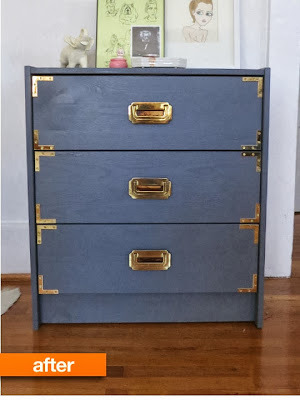 Ikea dresser hack money saving hints. Hint 1: To ensure the L-brackets line up perfectly, use another L-bracket to be the measuring tool. Simply line them up with the outside edge and screw the inside L-bracket in place. See below. Hint 2: Play around with different styles of decorations. The brackets also come in simple flat plates or t-brackets that you can also use to attach any way you choose. It all depends on the layout of the dresser and your particular style. Hint 3: Hardware handles can be expensive. I was lazy and didn’t want to fill in the existing holes on the drawers to put in double handle holes. Through some research at our local store, I had found single hole handles that resembled the style I was going for. They were about $7 each at the local home improvement store. That was a bit more expensive than I wanted to spend especially since this dresser had seven drawers. Jeff came to the rescue and found the exact same brand on ebay for less than $1 each. SCORE! Lesson learned, do some research prior to purchasing. T-handles from eBay - $1 each! Overall, my impulsive move last Saturday morning paid off. 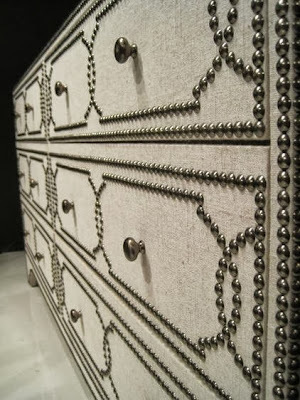 The dresser looks so much better in the room with its new finish and decorative metal touches. The best part was that it looks like a whole new dresser with the materials cost of just under $20. One wouldn't think that I disliked painting by the amount of things I've repainted recently, but I still loathe painting! It is like running or working out to me, I enjoy it, but only when it is all over and done. Remember this DIY personalized acrylic serving tray? Do you have anything you have been wanting to give a facelift? Just do it.